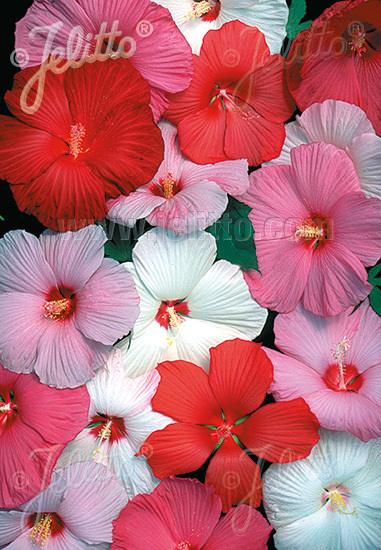 Special Features: Winter hardy selection with an exceptional color display of saucer-shaped blossoms up to 25 cm in diameter. Will flower the first year if planted early enough in the year but prefers two years to fully mature. Selection from Gilberg Farms. Historical: Selected from Gilberg Farms. Introduced by JELITTO PERENNIAL SEEDS in 2001. Foliage: Variety of different leaf types reflecting the influence of its genetic lines and thus resembling H. moscheutos, H. coccineus and others.